Biochar has the potential to sequester carbon and improve the properties of soils when used as an agricultural amendment. However, biochar will only be a viable option for carbon sequestration if there are uses and viable markets for this biochar. In recent years, there has been interest in adding biochar to agricultural soils in conjunction with compost, and in some cases, “co-composting” biochar—putting the biochar in with the feedstock before the composting altogether. Read on to learn about a study led by Dr. David Gang, a professor at Washington State University’s Institute of Biological Chemistry, indicating that co-composting can provide additional benefits, both during the composting process and to the crops grown in soil amended with the resulting co-composted biochar. Figure 1. 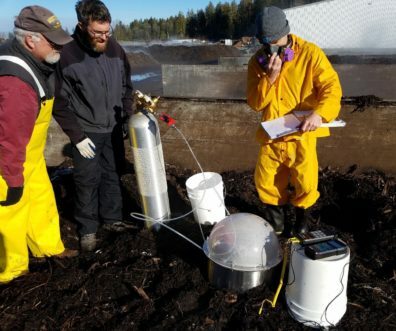 Mark Fuchs (left), John Cleary (right) (both of the Washington Department of Ecology) and Nathan Stacey (middle, WSU) use equipment to measure gas emissions from a commercial scale co-composting experiment. Photo: Doug Collins, WSU. This entry was posted in Carbon & Soil Organic Matter, Greenhouse Gas Emissions, Sustainable Practices on February 27, 2019 by sonia.hall. 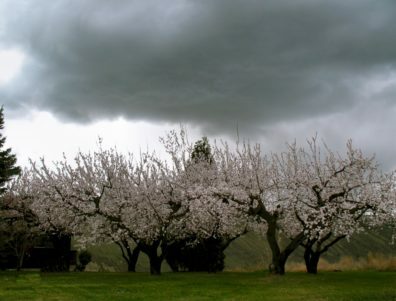 Farms and ranches are expected to face challenges as climate change leads to more extreme and variable weather. Photo: Flickr user Brent M. under CC BY 2.0. This entry was posted in Impacts & Adaptation, Sustainable Practices, Variability, Weather, & Extreme Events on February 19, 2019 by sonia.hall. 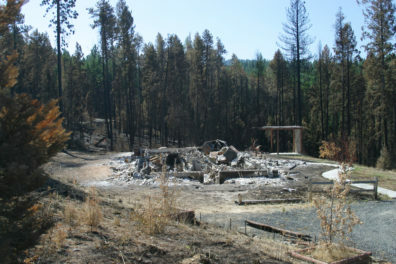 Different factors can contribute to homes burning in catastrophic fires, including climate change and where people choose to build. Photo: C. Schnepf. This entry was posted in Impacts & Adaptation, Sustainable Practices, Variability, Weather, & Extreme Events on February 14, 2019 by sonia.hall. This entry was posted in Impacts & Adaptation, Sustainable Practices, Variability, Weather, & Extreme Events on December 18, 2018 by sonia.hall. 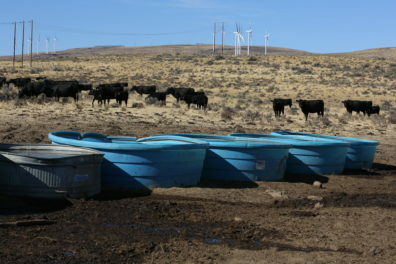 Northwest Rangelands – Where Do our Climate Vulnerabilities Lie? 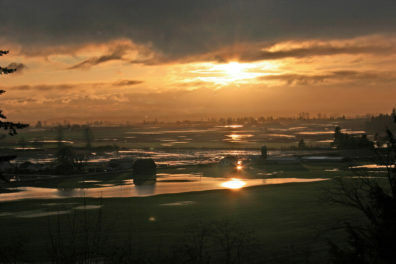 What will climate change look like on Pacific Northwest rangelands, which cover a huge area of our region? It will undoubtedly have complex impacts on the physical environment, environmental stressors, socio-economic factors, and the animals, plants, and other rangeland organisms. Recently, I took a look at the literature to see what the state of the science is relating to rangelands’ vulnerability to climate change. While there are a number of relevant studies that I mention below, I focus in this article on one of the few quantitative analyses, led by Matt Reeves, that updates Reeves’ previous work that was also discussed on agclimate.net. This entry was posted in Impacts & Adaptation, Sustainable Practices, Variability, Weather, & Extreme Events on November 16, 2018 by sonia.hall. 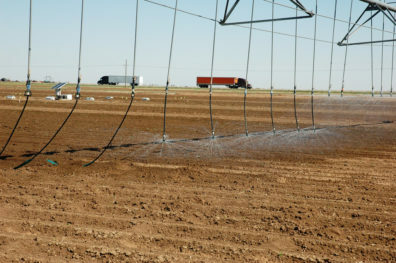 Irrigation Efficiency: What Do the Researchers Say? This entry was posted in Impacts & Adaptation, Sustainable Practices on November 9, 2018 by sonia.hall. A number of our articles this year discussed using biochar in agriculture and in forestry. These earlier articles did not delve into the methods to apply biochar on large tracts of forests. You’d expect this to be a much more challenging task than spreading biochar on croplands. Researchers and technology developers are tackling this particular issue, developing a specialized forest biochar spreader. Take a few minutes to check out their Science Spotlights article and their video. Among the details they discuss in the video is a point Chris Schnepf and Darren McAvoy made in their AgClimate article: biochar can use—and store the carbon that is in—those “leftovers” that otherwise get burned, releasing that carbon into the atmosphere. This entry was posted in Carbon & Soil Organic Matter, Greenhouse Gas Emissions, Impacts & Adaptation, Sustainable Practices on November 2, 2018 by sonia.hall. Topsoil has often been referred to as the “thin skin” of our planet, essential for producing the food that feeds us. Because it’s not easy to create new topsoil, conserving the soil that we have is essential for maintaining our region’s agricultural productivity. 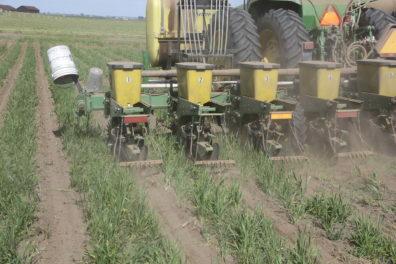 Reducing tillage, and leaving residue on the soil surface, is a proven way to reduce erosion. As residues break down, they increase the concentration of soil organic matter at the surface of the soil and help to form soil aggregates—a composite of soil particles that clump or bind together, giving soil its structure. Soil that is aggregated in larger particles is less prone to being eroded by the wind. And soils with more organic matter also benefit the climate, by storing more carbon. This entry was posted in Carbon & Soil Organic Matter, Impacts & Adaptation, Sustainable Practices on October 26, 2018 by sonia.hall. Water is a precious resource in the Columbia River Basin, and climate change could lead to changes in factors that affect how to most efficiently allocate water to the many uses and values in the region, a challenge even now. This future is not bleak, however. 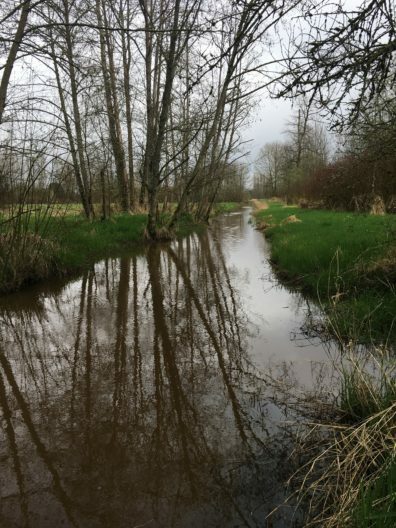 A research team led by Jon Yoder at Washington State University has been funded to develop new technologies to help decision-makers improve how they use water to meet the diverse needs of farms, people, fish and the rivers themselves. Check out this article on their research plans into smart market technology, seasonal forecasting, and automated monitoring of agricultural (and other) water use. Seasonal forecasting of water availability and crop productivity can inform the decisions of potential water market participants. Photo: Flickr user Pictoscribe under CC BY-NC-ND 2.0. This entry was posted in Impacts & Adaptation, Sustainable Practices, Variability, Weather, & Extreme Events on October 2, 2018 by sonia.hall.